The history of The Radio Bandcouver mixing boards. What I’ve had to deal with over the last 15 years. 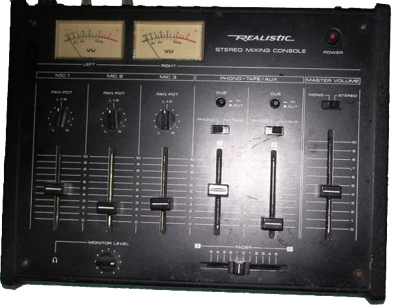 It all started in 1997, when all we had to mix live acts was the crappy old Co-op on-air board. Hardly the board to mix live acts with. It was a radio broadcast board ,( barely ), only really meant for announcing and stereo audio equipment like turntables, CD players, cassette players and reel to reel players. I had no budget ( neither did the station-probably STILL doesn’t ) for live sound equipment. Oh, it was interesting ,to say the least, mixing live acts with this thing. Note only quarter-inch inputs and the other 2 inputs were RCA. It worked alright with acoustic acts and you could get away with using adaptors on the last 2 RCA channels. But it was not a first class set up. But then, what do you expect from a station that rather fails to see the value of presenting live music ,and properly, on the air. You would think with the importance of giving independent Canadian talent a place to be heard and exposed, at least a small budget of a couple of grand would eventually be put aside in not making Co-op radio an embarrassment with live sound. 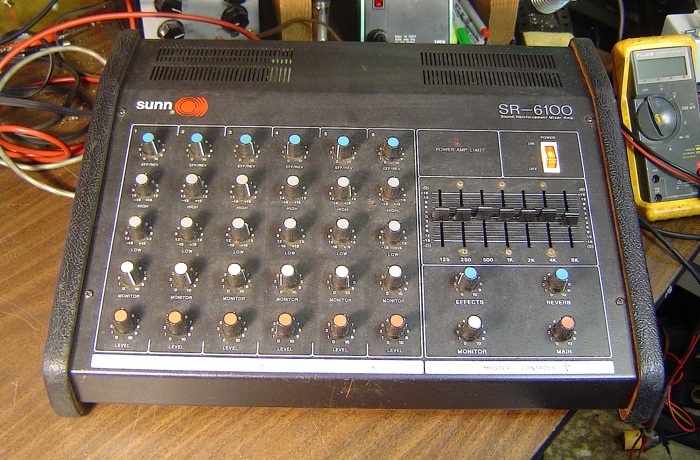 Next came ,with my own money of course, in 1999, The Sunn SR-6100 mono mixer from The Captain’s Place. It was a step up with 6 XLR ( industry standard mic inputs ), a monitor input, basic EQ and spring reverb. It did the job for quite some. Till about 2002. Some of the best sessions I did ,when Co-op was still in mono, were mixed on that handy ,fairly bulky, mixer amp: Colorifics, Lilyfrost, Bocephus King, Rich Hope, Veda Hille, Bughouse 5, John Ford, Circus In Flames, etc. But the ole board was falling apart. I luckily got to know a sound engineer named Martin Jordanov. He was long time soundman for a group called The Orchid Highway amongst a long list of other acts. He fixed the Sunn board as best as he could, as it was on its last legs. Then, it broke down for good around 2004 or so. I was without a decent board for a while. Then Martin had some spare mics, cables, stands and a board that wasn’t bad ,but, took up too much room in the control room: A Berhringer Eurorack 24, even though it had only 16 XLR inputs on it. It was alright ,but, didn’t have effects built in, and the extra equipment like digital compressor, digital effects and such made it too complicated a set up for a live music show that rarely had more than a half an hour to set up-while the canned music was running. It also didn’t help Berhringer was held in pretty bad regard with musicians, engineers and such for making cheap copies of other people’s designs. The older Eurorack ,pictured above, wasn’t a bad board. It just wasn’t practical for live, on-air sound in a control room that had limited table space. 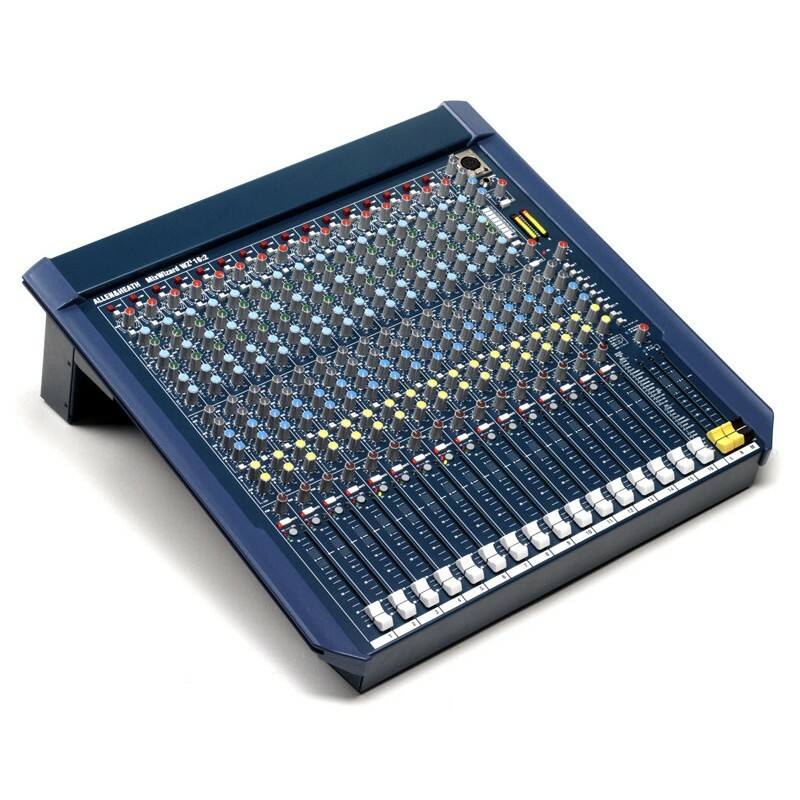 So, eventually after much deliberation, I settled on a used board of the Allen & Heath variety: The Mix Wizard 16. The best board I’ve ever used: 16 XLR channels, good EQ, tons of effects built in, and 6 monitor channels ( 6 aux ). I was later lending it out to Lana Lou’s ( along with a monitor or two) as I wasn’t booking too many live acts for a while on the show. It ,unfortunately got stolen, along with the monitors, mics, cables and di’s. Thankfully, Lana had insurance ,and after many months, I had it all replaced. The reason for not having too many live acts on the show for a while was: Co-op Radio was constantly having problems with the audio on its public archives. Even when I was mixing acts at less then 0 on the VU meters, the sound I heard later on was absolutely horrifying! Everything ,especially vocals, was distorting! It was a huge embarrassment for quite some time, and what might have hurt Radio Bandcouver in its fundraising endeavors in recent years. Co-op finally has the public archives sound together, after the much-hyped switch with The Peak to 100.5.,but, no equipment upgrades. Setting up live music is still a chore ,but, the show will have live music more often than it has in recent years, now that the online sound is acceptable. It’s rather sad I’ve had to go into my own pocket, or rely on help outside the station ,( for the most apart ), to make it happen again at Co-op. When I first started doing Radio Bandcouver, there was virtually nothing to work with at all. I’ve been told Co-op has had decent sound equipment in the past ,but, it’s all been stolen. So I would guess management there has seen no real reason to seriously invest in it anymore. I hope with the money we got with the switch with The Peak, something eventually goes towards improving Co-op’s live music capabilities. Local, independent music is one of the staples at other listener-sponsored, community oriented radio stations. It should be at Co-op as well. It would be a refreshing change if it wasn’t put on the back-burner for once. We’re not talking tens of thousands of dollars here. 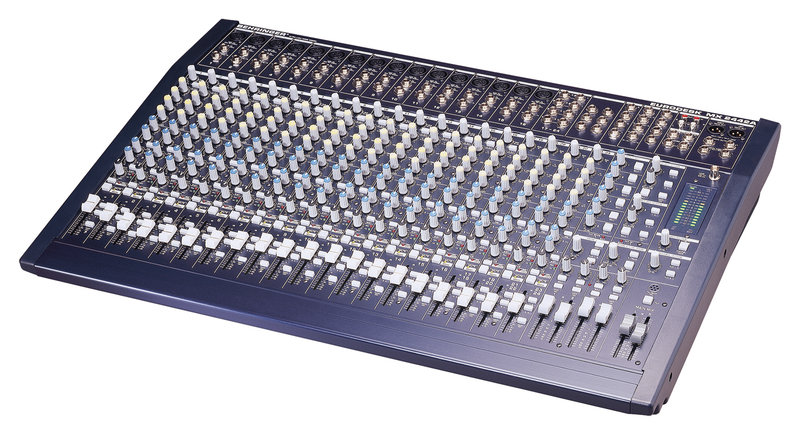 Just enough to simply replace or upgrade mics, cables, stands, monitors and mixing board upgrades when needed. A dedicated, permanent set up in the control room would help as well. The amount of time and stress with set up and rip down would be greatly reduced. I know to some this may be a little far-fetched, but, live music and musicians are a part of the community too. ~ by bandcouver on December 29, 2012. Hopeful Changes After The Move In June.